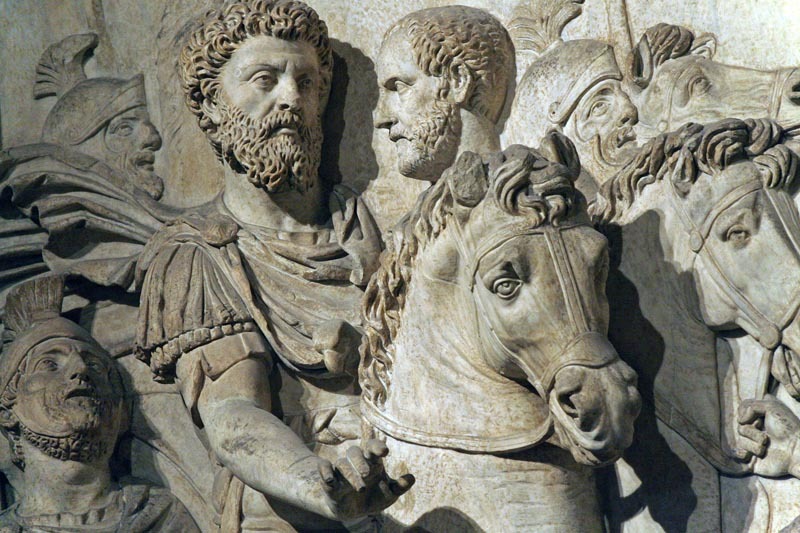 We now get to the third of the three great Roman Stoics as seen from a Christian perspective, following along C. Kavin Rowe’s One True Life: the Stoics and Early Christians as Rival Traditions. (Part I on Seneca is here; part II on Epictetus here.) Of course the analysis is based entirely on the Meditations, about which Pierre Hadot said: “Marcus Aurelius’ Meditations … are not the spontaneous outpourings of a soul that wants to express its thoughts immediately, but rather an exercise, accomplished in accordance with definite rules. … [The Meditations ] presuppose a pre-existing canvas, upon which the philosopher-emperor could only embroider.” And a significant part of that canvas was provided by the work of Epictetus, which Marcus had read and studied. Also keep in mind, throughout the following, that the Meditations are characterized by Marcus going back over and over to the three Epictetean disciplines of desire, action, and assent. As usual, Rowe proceeds by discussion what he sees as the major themes emerging from a given author’s work, and in this case the first theme is that of death. Marcus did spend a significant amount of time in the Meditations talking about death, similar to Seneca, and definitely more than Epictetus. Considering that he wrote the diary while on a military campaign against the Marcomanni, this is probably not surprising, quite aside from the general interest of the Stoics in the topic, and of whatever aspect of Marcus’ personality this may also reflect. Rowe then takes up an intimately related theme, that of human beings and the possibility of right judgments. He says: “If we were to ask Marcus how exactly ‘Nature has given us authority over impressions,’ he would respond with one word: the hēgemonikon (governing-faculty within us).” Epictetus tells us that a major goal of Stoic training is, in fact, to sharpen our hēgemonikon, which becomes lazy and inaccurate if we don’t pay attention. In modern scientific parlance, the hēgemonikon is roughly analogous to the brain’s executive functions, housed primarily in the dorsolateral prefrontal cortex, the anterior cingulate cortex, and the orbitofrontal cortex. I plan on writing a separate essay on the relationship between the hēgemonikon and the executive functions, as there is much that the modern Stoic can learn from current neuroscience in this respect. Finally, Rowe focuses on “Marcus’s use of the word metadidaskalein [which] shows [that] ‘teaching’ is much broader than ‘do or don’t do this specific thing.’ More comprehensively, metadidaskalein points to the need to adopt a new frame of reference, or mode of understanding the world.” Which is, of course, what Stoicism (or any other life philosophy) aims at providing. This entry was posted in Marcus, Other philosophies and tagged One True Life on January 4, 2017 by Massimo. I wonder if at least part of the reason for the change in the use of the word “dogma”, which I was previously unaware of, is due to the difference between schools of thought (including Stoicism) and religions (particularly Buddhism) which are concerned with method and those (particularly the religions of the Book) which make claims to absolute truth. In the first case one would need to practice the skill of making right judgments in any given circumstances, while in the second the judgments have to conform to some claimed revealed truth, and then become an extension of the revealed truth that cannot be questioned. Probably. The change in meaning in the Western tradition certainly did occur during the reign of Christianity in the Middle Ages. ‘One Life‘ is a remarkable book for its lucid, well balanced arguments, deep research and profound conclusions. What a lovely piece of writing it is. I find myself having to make an intellectual volte-face once again, just as this atheist did before when he followed the evidence, gave up cherished beliefs and concluded that God did indeed exist(You are free to disagree, I respect disagreements). I started the book agreeing with Massimo and ended the book agreeing with Rowe, who I think, has made a most powerful argument. I wholeheartedly support Rowe’s conclusion that the two rival traditions are incommensurate, that the bricolage approach(chapter 9) eviscerates the essential meaning of the traditions as lived philosophies. I don’t necessarily agree with all that he says but I think the main thrust of his argument is incontestable. My detailed arguments in support of my contention can wait until Massimo deals with the conclusion. For now, though, I want to apologise to Nancy. I vigorously opposed her arguments about Seneca and I was wrong. Nancy, I must admit that you were right and that I was wrong. My reading of Rowe’s book has forced me to make a radical revision of how I understand what you said. Nancy, I sincerely apologise and I hope you can accept my apology. I am posting my comment here because the original post has been closed. I thank Massimo for bringing this outstanding book to our attention. I recommend it to Stoics and Christians, who both can learn from it. It is important to note that my previous argument is not arguing for one tradition or another. I think each person must make up his own mind about that. What is important is living your philosophy, whichever you choose, with a deep and authentic commitment. We expect the founding figures of a tradition to be clarion examples of a deep and authentic commitment to living their philosophy. This really is the heart of Nancy’s criticism, that Seneca is not a believable example. I suspect she would include Marcus Aurelius in her criticism and I would agree. I’m glad you found the boook worthwhile, and am looking forward to more discussion when I get to cover Rowe’s crucial argument for incommensurability (which I find only mildly convincing). However, I still think that Nancy’s criticism of Seneca is hurried (because the historical evidence is ambiguous at best), and that no similar criticism can possibly be raised against Marcus. More importantly, it doesn’t really matter. Would you reject Christianity if you found out that, say, Paul’s life was less than exemplar? Would his writings be therefore automatically discarded? That is the problem we have with ancient authors, trying to make sense of fragmentary writings. For example, the four Gospels record a total of 35 days out of about 1000 days of Jesus’ ministry. That is such a difficult question since the truth of a teaching should not depend on the character of the teacher. I think the answer is that we are dealing with more than truth. Truth, to be effective, must ignite our moral imagination. This happens when the teacher lives out his teachings in such a profound way that it fires up our imagination. This is why Jesus, Buddha and Confucius founded great movements. And, I think, this is why Stoicism stalled. Returning to the present, I think we are faced with exactly the same problem. The great faith traditions’ appeal rest in the lives of their founders, while Stoicism, by comparison, has an ambiguous foundation. On the other hand, today’s technocratic, meritocratic peoples might find the figures of Cicero, Seneca, Epictetus and Marcus more appealing precisely because it is un-cool today to make enthusiastic all-out commitments to living a philosophy. Besides the fact that I still don’t understand why you equate Marcus and Seneca, character-wise. What about Epictetus? Or Zeno? Or Cato? Or Cleanthes? Or Musonius? So far as we know those were all outstanding examples of moral humans. the foundations of Stoicism are much more clear than those of many religions, because they are rooted in reason, not faith or revelation. That, however, is likely why Stoicism has never been mainstream after the fall of the Roman Empire. They are clear because they were written in literate, stable, well organised communities that valued library collections. The fall of the Empire did a lot of damage to this record but it is still better than any other record. I will return to this fascinating discussion in the morning.